10/1/2011Share this story on Facebook! Professor Andy Smith in his lab with a student. IC's biology department offers a variety of research opportunities and projects. You know the instructions for glue: Apply to a clean, dry surface. So how do snails, slugs, and oysters stick to wet, slimy surfaces so ferociously you’d need a chisel to get them off? 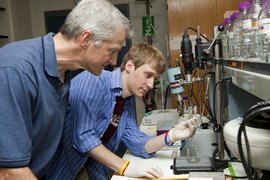 That’s what IC biology professor Andy Smith studies—he believes the adhesive secretions of mollusks have potentially valuable medical applications. And students collaborate with him on this research. “We start easy,” Smith says, “teaching techniques. Then gradually students get more independence. If they stay with it, they’ll be running their own projects. By the time they’re seniors, we’re interpreting data, figuring out what we need to do before we can publish.” So far, 17 Ithaca undergrads have coauthored papers with Professor Smith and three were lead authors. “What they’re able to do here is really remarkable,” Smith says.